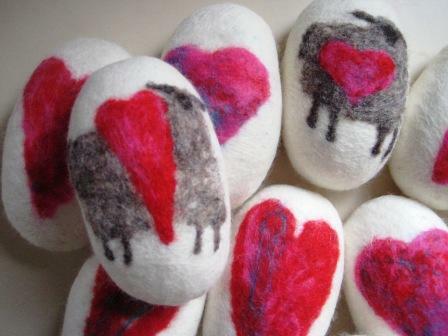 I’ve been busy making my ‘Soap in Sheep’s Clothing’…aka felted soap…with a heart-felt, valentine theme! 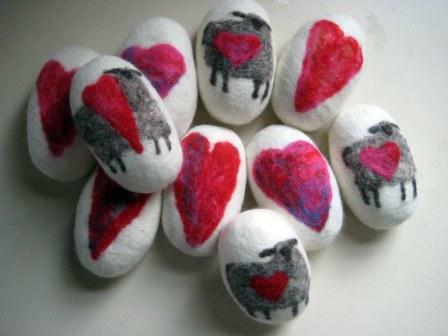 And, more sheepy-themed felted soap too! Good ~ Clean ~ Fun…AND, no special tools required! If you’re wondering what or why are you felting soap??? I’m basically wrapping a bar of soap in wool and felting it around the soap…kind of like ‘relief’ felting. You end up with a sort of built-in scrubby wash cloth that’s great for gently exfoliating your skin ~ or ~ what a lot of folks do…simply place it in the bathroom to look pretty, gift it to a fiber friend or sheep fanatic, or place it with your yarn stash as a pest deterrent! AND, when the soap is expired, you can re-use the little wooly pouch! Now, isn’t that smart? 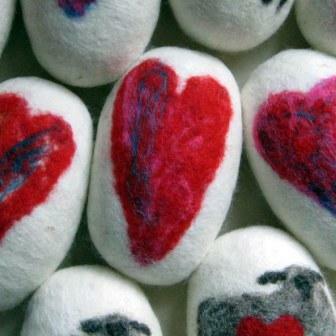 These felted soaps are headed to a near-by local yarn shop… maybe I’ll list one or two in my shop?